Please note: Prasant is now sharing content regularly on Youtube in 2019. Please subscribe to his channel for updates. You can also subscribe to this website by entering your email in the sidebar–>. Or you can sign up for the email list (occasional). February 20, 2019: With The Alaya Project at California Jazz Conservatory, Rendon Hall, Berkeley, CA. With Rohan Krishnamurthy: Mridangam, drum set, percussion, Colin Hogan: Keyboard. 7pm. March 3, 2019: With Abhinaya Dance Company of San Jose. Si Se Puede – the Struggles of Cesar Chavez. Mexican Heritage Plaza, San Jose, CA. 4pm. Dec 1, 2018: Live performance on KPFA Radio with Rohan Krishnamurthy’s Alaya Project. With Rohan Krishnamurthy: Mridangam, drum set, percussion, Colin Hogan: Keyboard. Though 2009. Please note concerts between 2012-2015 are not all listed. November 18, 2018 – Carnatic saxophone concert at Sri Ashta Lakshmi Temple with Ajay Gopi, Mridangam. San Mateo, CA. November 11, 2018 – Concert for Kala Mudhrika with Poovalur Sriji (percussion), Jonathan Jones (clarinet), Raman Kalyan (flute), Shubha Chandramouli (mridangam). Preceded by a lecture demonstation by Sriji and Shubha titled “Yati Prana.” Plano, TX. November 3rd and 4th, 2018 – Performances with Abhinaya Dance Company – Stories of Justice. Mexican Heritage Theater, San Jose, CA. October 26, 2018 – Performance with Keenan Webster (Kora, Balafon and other instruments) and Patricio Angulo (drums and percussion) for Friday Night’s at de Young. de Young Museum, San Francisco, CA. October 6, 2018 – Solo Carnatic saxophone concert for Bharati Kala Manram. With Maiyuran Gireedharan: Violin, Vijay Ganesh: Mridangam. At SVBF Hall in Etobicoke, ON. Toronto, Canada. October 1, 2018 – Recitals by Prasant’s saxophone students for Navarathri at Sri Raja Rajeswari Temple. San Jose, CA. August 23, 2018 – With the Supplicants at Cafe Stritch, San Jose, CA. August 19, 2018 – With With Sameer Gupta’s A Circle Has No Beginning at Freight & Salvage, Berkeley, CA. August 16, 2018 – With Sameer Gupta’s A Circle Has No Beginning at Center for New Music, San Francisco, CA. August 13, 2018 – With Sameer Gupta’s A Circle Has No Beginning at Blue Whale, Los Angeles, CA. August 12, 2018 – Morning Solo performance at BELOVED Festival in Tidewater, Oregon. July 11th, 2018 – Private concert, Livermore Temple, CA. July 7, 2018 – With Charlotte Moraga (Kathak dance performance) at Sunnyside Conservatory, San Francisco, CA. Ranjana Ghatak: vocal, Suresh Vaidiyanathan: Tabla. June 16th, 2018: Ragamalika 25th anniversary performance. Varnaajalam, at ICC Milpitas, CA. May 27, 2018: Duet with saxophonist Hafez Modirzadeh for SFIAF. 4:30pm at Firehouse in Fort Mason, San Francisco, CA. May 20, 2018: Private concert, Petaluma, CA. May 15-18, 2018: Performance with Poovalur Sriji ensemble with Taipei Chinese Orchestra. eslite Performance Hall, Taipei, Taiwan. April 7, 2018: Short performance at the MAPP, Red Poppy Art House, San Francisco, CA. April 6, 2018: With Meklit at SFJazz, San Francisco, CA. The Ivy Room, Albany, CA. December 16th, 2017: Brief charity performance for Matters of Community. Royal Palace, Fremont, CA. 6pm. November 11th and 12th, 2017: Apoorva Katha with Abhinaya Dance Company. Mexican Heritage Plaza, San Jose, CA. November 11th, 2017: Private concert, Morgan Hill, CA. October 20, 2017: With Meklit at the New Parish in Oakland, CA. Oct 1, 2017: Carnatic saxophone concert at Indian Fine Arts of Arizona. Arun Ramamurthi: Violin, Mridangam: Sudhakar Subramaniam and Sharreth. 4pm, Murdock Hall, ASU. Phoenix, AZ. September 24, 2017: VidyA at SF Music Day. At the SF War Memorial Building, 6:30-7pm in the Education Studio. With Eric Vogler: Bass, Vijay Anderson: Drums, Rohan Krishnamurthy: Mridangam. September 16, 2017: With Brooklyn Raga Massive and Classical Revolution at Yerba Buena Gardens Festival performing “In C” by Terry Riley. 1pm. San Francisco, CA. September 2, 2017: Private concert, Mineapolis, MN. August 19, 2017: VidyA at Red Poppy Art House, San Francisco, CA. David Ewell: Bass, Sameer Gupta: Drums. This concert was recorded live by Art Granoff and will be available for listening and viewing very soon. June 2nd and 3, 2017: Undercover Presents: 50 year anniversary, Sgt. Peppers Lonely Hearts Club Band at UC Theatre. 7pm doors, 8pm show. Rohan Krishnamurthy: percussion, Prasant Radhakrishnan: Tenor saxophone, Colin Hogan: Keys. April 29, 2017: With Rohan Krishnamurthy at Community Music Center, San Francisco, CA. April 24, 2017: Prasant Radhakrishnan’s VidyA at Foster City Library. 6:30pm. David Ewell: bass, Hamir Atwal: Drums, Rohan Krishnamurthy: Mridangam. November 26, 2016: Concert and Sangeetha Satsang at Sri Raja Rajeshwari Temple, San Jose, CA. Click here for a transcript of the brief talk. October 20-21st: Carnatic saxophone concert. Private event. Livermore Temple, CA. October 14, 2016: Carnatic saxophone private event, Livermore Temple, CA. October 1, 2016: Carnatic saxophone concert and student performances at Sri Raja Rajeswari Temple, San Jose, CA. Gopi Lakshminarayanan: mridangam. September 3, 2016: Carnatic saxophone private event, San Francisco, CA. July 10, 2016: Carnatic saxophone private concert, Hayes Mansion, CA. June 12, 2016: Carnatic saxophone wedding concert, Dunsmuir Hellman Historic Estate, Oakland, CA. May 29, 2016: Maha Rudram at Sri Raja Rajeswari Temple, San Jose, CA. Prasant’s students recital at 3pm. See the lessons page for photos from this event. April 24, 2016: Duet with Sameer Gupta at Red Poppy Art House as part of Brooklyn Raga Massive Presents: A Night of Cross-Coastal Raga-Inspired Music. Many wonderful artists from the SF Bay Area playing with the BRM artists from the East Coast. Info here. Check out Brooklyn Raga Massive’s website. Please support them and their excellent endeavor bringing forward raga music in NYC and beyond. Apri 16, 2016: Carnatic saxophone concert at Chithirai Festival organized by Bay Area Tamil Manram. 12-2pm. At Centerville Junior High School. 37720 Fremont Blvd, Fremont, CA 94536. 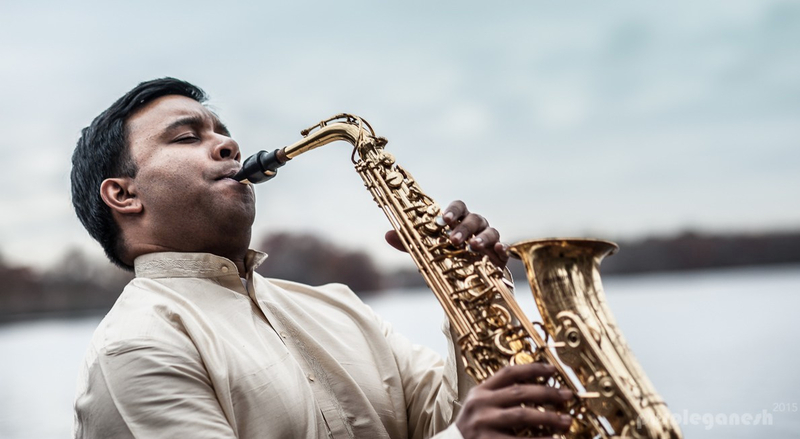 Prasant Radhakrishnan: Alto saxophone, Balaji Mahadevan: Tavil. January 31, 2016: Sangeeta Satsang performance at HSNEF, Jacksonville,FL. At 12 noon after temple arathi. More info on satsang. November 20, 2015: Prasant Radhakrishnan’s VidyA. at Presidio Sessions in San Francisco. Prasant – Saxophone, David Ewell – Bass, Vijay Anderson: Drums. Rohan Krishnamurthy – Mridangam. November 13, 2015: 7pm. Music meditation gathering in a private residence Lexington, MA. Free to attend. For details to attend, please send a message with the contact form. November 12, 2015: Carnatic saxophone concert at Shri Sai Chavadi Sai Temple with Mali Santhanakrishnan on mridangam. 6-7:30pm, Canton, MA. 960 Turnpike Street, Suite 28 Canton MA 02021. Free to attend. November 12, 2015: Guest lecture at Suffolk University, Music and the Brain class. 2:30-3:45. Room 302. September 6, 2015: Private event, Raleigh, NC. Nov 7, 2015: With Kiranavali Vidyasankar‘s Tradition: An Evolving Continuum Project funded by the Pew Center for Arts and Heritage. October 25, 2015: Prasant Radhakrishnan’s VidyA at SF Chamber Music Day. August 7, 2015: With Bengal & Beyond at People in Plazas, San Francisco. July 25, 2015: Private Event, Hopland, CA. October 18, 2009 Performing Diaspora Work in Progress. Counterpulse. SF, CA. 11am. September 26, 2009 Carnatic concert with Narasimhan – Violin, Poovalur Sriji – Mridangam. Karya Siddhi Hanuman Temple, Frisco, Texas. June 23, 2009 VidyA at San Jose Flavors of Jazz Festival Maggiano’s. San Jose, CA. 6:30pm. June 14, 2009 Healing Ragas on Saxophone for healing and meditation session. Sangati Center, San Francisco, CA 4pm.